Harbor City Music Company Show Chorus is an award-winning group of women who sing 4-part a cappella music. Our repertoire ranges from Broadway to barbershop, the Beatles to Billy Joel, and just about everything in between. We’re always looking for women who like to sing – you don’t have to read music or have any experience beyond singing in the shower or in your car. It’s not just about singing. HCMC is a close family of “sisters in song” who share joys and concerns each week. Tenor is the highest voice, and sings a light harmony. No shrill sopranos here. Lead is sung by the middle voice, and typically carries the melody in the strongest part of the vocal range. Baritone is a harmony part for the middle voice. Bass is the lowest voice, providing the rich sound for which barbershop is known. At 7:25, just before rehearsal starts, we usually do some physical warm-ups led by our choreo team, then our director, assistant director or section leaders lead the vocal warm-ups. You are welcome to join us for these exercises to get a feel of what it’s like up on the risers. After the warm-ups, on your first visit we suggest you “sit out” and watch the chorus rehearse. Especially if we are close to a performance or competition, rehearsal can be fast and furious. If you choose, you can borrow a music book and stay on the risers (unless we are rehearsing choreography and need to have everybody in their assigned places). 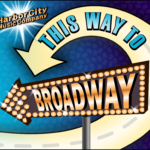 After rehearsal, if you decide you’d like to audition, you’ll be given a song to learn (sheet music and a CD recording of your part) and more information about the audition process. Many visitors have been so impressed by our performance at rehearsal that they say “I could never do that.” Please remember that we are all regular people like you. Most of us don’t read music or have any formal musical training. Our director is a voice teacher, and every rehearsal is like a voice lesson. You’ll learn quickly and before you know it you’ll be singing and moving on the risers like a pro. Give yourself the chance and you’ll never regret it. Take Exit 10A off of Route 97 (Benfield Blvd). Follow Rt. 10, crossing Rt. 100 until Rt. 10 meets Rt. 2 (Ritchie Hwy). Rt. 10 will ends at Rt. 2 – Ritchie Hwy. Find your way to Rt. 2 – Ritchie Hwy.